Tag line: "No man, no law, no war can stop him"
While serving hard time for the trouble he caused in Colorado (see First Blood), Green Beret John Rambo (Sylvester Stallone) is approached by Col. Trautman (Richard Crenna), his former commanding officer, with a proposition: sign up for a mission to determine if there are still American POWs being held in Vietnam, and receive a full Presidential pardon in return. With nothing to lose, Rambo agrees, and is shuttled off to Vietnam, where bureaucrat Marshall Murdoch (Charles Napier), who’s in charge of the operation, fills him in on his assignment. As per Murdoch, Rambo will link up with Co Bao (Julia Nickson), a U.S. operative working incognito in Vietnam, and make his way to the site of a former prisoner of war camp, where’s he’s to take pictures of the area and report back with his findings. Once there, Rambo and Co Bao discover there are, indeed, American soldiers still in captivity, and against Murdoch’s orders, Rambo rescues one and heads back to the rendezvous point. Unfortunately for him, Murdoch pulls the plug on the mission before he’s extracted, leaving Rambo at the mercy of a sadistic Vietnamese camp Commander (William Ghent) as well as the Soviet officer (Steven Berkoff) assigned to the area. But as these two will soon discover, there isn’t a prison camp in the world that can keep John Rambo locked up! A sequel to 1982’s First Blood, Rambo: First Blood Part II takes a very different approach to its story. While First Blood was as much a character study as it was a shoot-‘em-up, exploring the emotional trauma its lead character was subjected to as a result of his service in Vietnam, Rambo is a straight-up action film, with gunfire and explosions aplenty. And on that level, the movie works, providing a number of exciting battle scenes, regardless of how implausible they might be (Both the Vietnamese and Soviet troops fire hundreds of rounds at Rambo, never hitting him once, whereas our hero can kill an enemy soldier with a single shot, and from a hundred yards away). 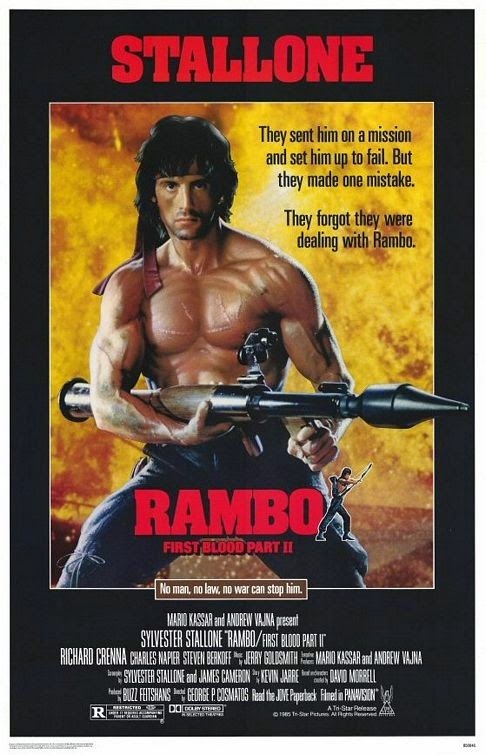 What’s more, Rambo introduces us to a brand new weapon, which the lead uses several times throughout the movie: arrows with exploding tips that, when fired, can take out half an enemy battalion! Rambo: First Blood Part II does have a few minor issues you’ll have to contend with, chief among them being the film’s cringe-worthy dialogue (along with Co Bao’s broken English, there’s Rambo’s schmaltzy final speech, which was particularly painful to sit through). But if it’s amped-up action you’re after, then Rambo: First Blood Part II is the movie for you.